Your home is probably your biggest investment, and maintaining that investment is an important and ongoing part of homeownership throughout the year. The frequent care and attention your home demands can sometimes mean you need to call on help. 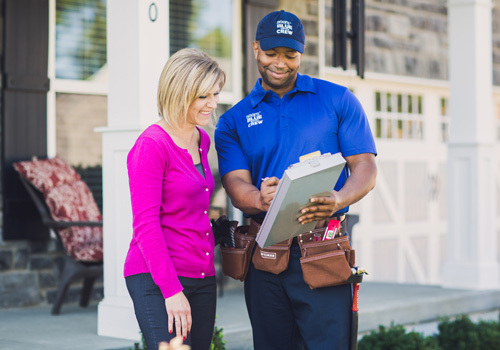 When you don't have the time or skills to tackle your home improvements, repairs or renovations, a Sears Handyman can help in a variety of ways. From building that dream deck to fixing a leaking faucet, our experienced Handyman Technicians can help. Give us a call at (678) 549-7828. For those minor electrical issues that you don't feel comfortable doing yourself and that don't require a professional electrician, a Sears Handyman can help. Our experienced handyman professionals can repair or replace ceiling fans, lighting fixtures, switches, outlets, as well as install recessed and LED lighting. Contact a Sears Handyman near you for these and other electrical needs. While drywall is a great building material, it doesn't stand up very well to being struck by solid objects like a door knob or the corner of that over-sized table that was carelessly delivered last week. Let's face it, accidents happen. Drywall scuffs, nicks, and damages fairly easily, which results in unsightly consequences for your home. From minor to major drywall repair and replacement, contact an experienced Handyman Technician from Sears Handyman Services. Decks extend our living space for family gatherings, barbeques, and relaxation; however, deck maintenance and repair can be time consuming. Sears Handyman Technicians can help with maintenance issues from deck sealing to wood rot, or we can give your deck a face-lift with new railings or a privacy wall. Our Handymen can even build you an outdoor deck from scratch. Fencing is a great way to add privacy to your yard, increased your property value, and define boundaries. Sears Handyman technicians have the expertise to install many types of fencing from picket to chain link. Exterior painting can dramatically increase the curb appeal of your home. Painting is often time-consuming, especially in hard-to-reach places or where wallpaper has to be removed, and many home owners don't feel comfortable on ladders. For all of your interior and exterior painting tasks, a Sears Handyman professional is available to help you get the job done right.